March 2 is Dr. Seuss’s birthday! When I taught first grade, we always celebrated by wearing Dr. Seuss T-shirts, cooking green eggs and ham in the classroom, and reading all the kids’ favorite DS books. But now that I’ve moved on to a different career, I decided to use this well-loved T-shirt for my next “What can you make with a . . .” refashion. First, I used the bottom of the shirt for the no-sew spaghetti t-shirt scarf that I shared last month. 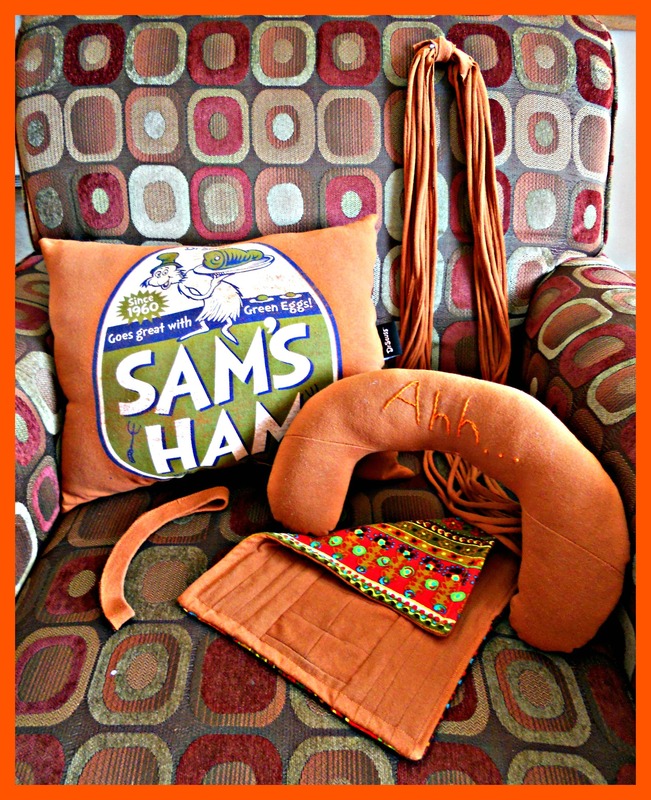 Next, I used the “Sam’s Ham” graphic and back for a pillow (which is now on its way to some sweet little guys in Florida along with a copy of the matching book). I love that the T-shirt had a Dr. Seuss label that I could stitch into the side seam of the pillow! The rest of the scraps were stitched together into a rectangle and paired with a colorful remnant to make a little mat to put under a centerpiece or plant. I didn’t know his birthday was coming up — I love Dr. Seuss! My favorite book of his is The Lorax. Also, I’m always, always amazed at your creativity. So many projects from one shirt! And I love that pillow — it’s perfect! Thank you! 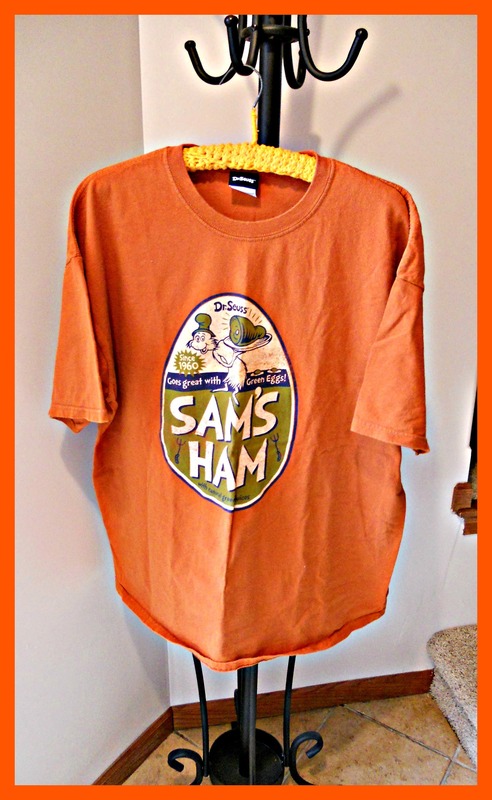 I always loved that cute can of “Sam’s Ham” so it’s fun to pass it on instead of letting it sit in my t-shirt drawer! That is so (sew) very kewl!!! I absolutely love your projects! Very resourceful! Love the pillow – and what a great idea to put the tag in the side! I tend to put all the small pieces in the bin:( Daughters school are having a fill a jam jar game at the next BBQ, I think the idea is bring a jam jar and collect one… mine could be full of scraps fo fabric!! I always get great ideas for REmissionary projects from you – love this remake. We read Dr Seuss to our kids when they were little too; my late husband LOVED those books as much as the kids did. Those are so cute! I love the pillow – who wouldn’t? I love Dr. Seuss, I was going to write a post shortly where I took an adult tee shirt and made it into one for a little girl and then used the neck band for her hair, you beat me too it. She loves her quick no sew head band. You’ve done it again. What an inspiration. You ‘really’ do have the art of repurposing down to an art. I guess that is why we all tune in to see what you are up to. I love Dr Seuss’isms and I can almost see you making those Green Eggs and Ham. What a great teacher you were to include such a fun and unexpected event! I’m looking forward to seeing the apron! All of your aprons are cute! gotta love the pillow…just neat! I knew there was going to be a Dr. Seuss pillow and I love it. I can see it and the Ahh…pillow tucked in a reading corner of a first grade classroom. So clever! Oh the tee shirt made an adorable pillow…you would never have known the origin if you hadn’t told us! Love the graphic on the t-shirt, perfect for a pillow. HaHa. You will love it. I used to read it to the young ones with dramatic emphasis! “I yelled for help. I screamed. I shrieked. Love the idea of using the necklace as a no-sew headband! How very fun! You are too sweet Katherine! I felt bad, not posting for weeks… but I AM really busy lol! even dropped out of the collectively for this month 😦 but I’ll try and post more! I love how you recycled those small parts, very clever! Thanks so much for a great trip down Memory Lane with the updated looks you came up with! I am a big Dr. Seuss fan, and love the pillow. The headband idea is fantastic too. Wishing you a day full of all the thinks you can think. I remember making green eggs and ham for my sons when they were in Elementary school on Dr. Suess’ B-Day! Wow- 5 things from a T-shirt! The Dr. Seuss pillow looks like it’s from an expensive boutique. Enjoying all the fun and useful projects you come up with. I particularly like the cushion – very effective – lucky recipient! You are so awesomely creative!